Click here to see a YouTube video of the 2018 Performance Power sale offering! 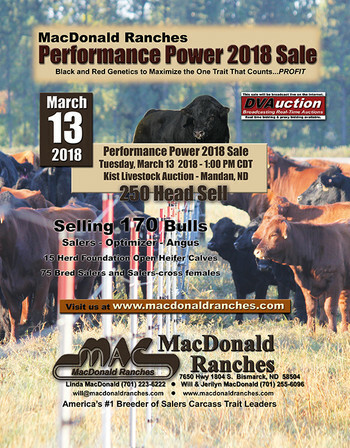 The Performance Power 2018 Sale catalog is ready! Click above to take a look. 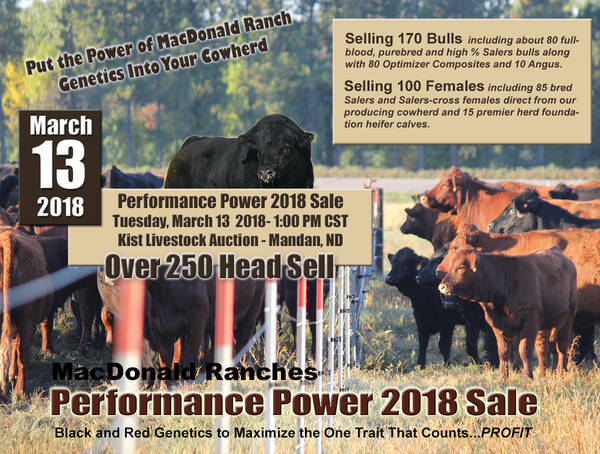 MacDonald Ranches Performance Power 2018 Sale is scheduled to be held on Tuesday, March 13 at Kist Livestock Auction in Mandan, ND. 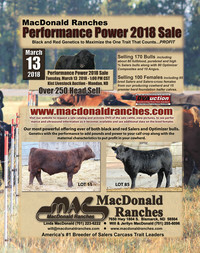 Selling will be about 170 bulls, including about 80 that are purebred and high percentage Salers and another 80 that are Optimizer composite bulls (Salers in combination with Angus or Red Angus genetics). The bull selection will be rounded out with about 10 Angus bulls. 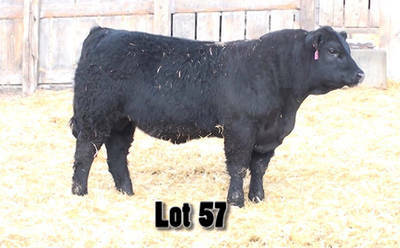 Also selling will be 15 open heifer calves selected from the top of our replacement pen and about 85 head of bred Salers and Optimizer females direct from our own cowherd that will sell in groups of 3 to 12 head.